An official in Kenya said the country's main international airport in Nairobi reopened after a massive early-morning fire destroyed the arrivals hall on Wednesday forcing the closure of East Africa's largest airport and the rerouting of all inbound flights. The airport has opened its doors again for domestic and cargo flights. Michael Kamau, the cabinet secretary for transport and infrastructure, said plans are under way to change another of the airport's units into an international terminal so those flights can resume as well. Kenya Airways said on Wednesday its first overseas flights to land at the Kenyan capital's fire-damaged airport would arrive as scheduled early on Thursday. "Flights from London and from Bangkok will arrive in Nairobi tomorrow morning as scheduled, and will be processed through the domestic terminal," the national flag carrier said in a statement. No serious injuries were reported, said Kamau. Two people were treated for smoke inhalation. 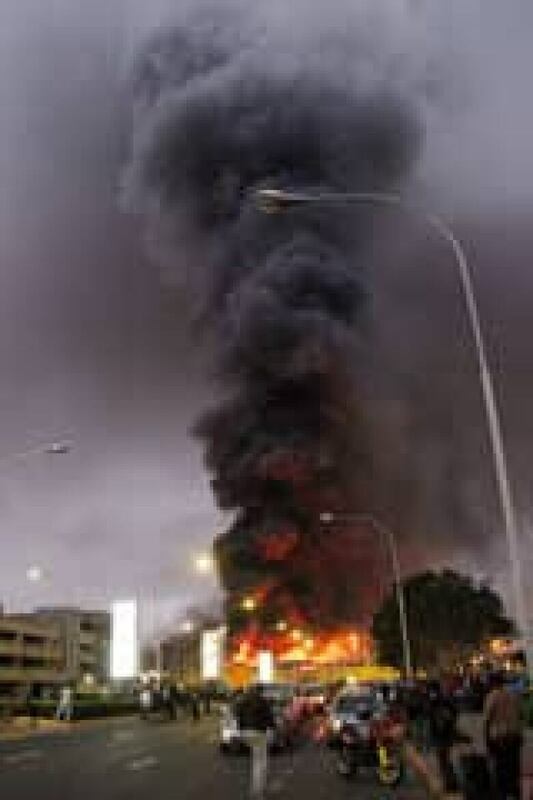 The fire broke out on the 15th anniversary of the bombings of the U.S. embassy buildings in Nairobi and Dar es Salaam, in neighbouring Tanzania, but there were no immediate signs Wednesday's fire was an attack. Kenya's anti-terror police boss, Boniface Mwaniki, told The Associated Press that he is waiting for the fire to be put out so that he can inspect the scene before making a judgment. Dark black smoke was visible across much of Nairobi as emergency teams battled the blaze. Passengers reported a slow response by the under-resourced fire brigade. The fire raged for more than four hours before being contained, though flames still persisted two hours later. "It was huge, the smoke billowing, and it didn't seem to be stopping," said Barry Fisher, who had hoped to fly to Ethiopia on Wednesday morning. The fire gutted the international arrivals hall, where passengers pass through immigration and retrieve their luggage. The Kenya Airports Authority closed Jomo Kenyatta International Airport until further notice. "We reassure international and local travellers that arrangements are being put in place to restore normal operations. 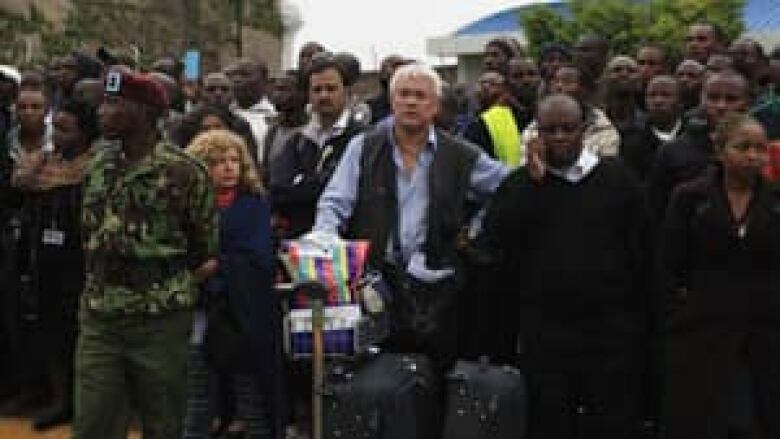 The airlines are working to assist stranded passengers and advise them on the measures being put in place to resume services at JKIA," said Stephen Gichuki, the director of the Kenyan Airports Authority. The Nairobi airport is the busiest in East Africa, and its closure is likely to affect flights throughout the region and beyond. Kamau said the fire began at 5 a.m. local time in the immigration section of the arrivals hall. Inbound flights were diverted to the coastal city of Mombasa, he said. Kenya's Red Cross said that flights were also being diverted to Dar es Salaam, Entebbe, Uganda and the Kenyan cities of Eldoret and Kisumu. As in many countries in East Africa, public sector services like police and fire units in Kenya are hobbled by small budgets and outdated or no equipment. Many of the responding units to Wednesday's fire were from private security firms. A British passenger, Martyn Collbeck, said he was surprised that the airport wasn't shut sooner so that emergency vehicles could respond. "When I arrived there were one or two fire engines parked outside the international arrivals. It spread very fast," said Collbeck, who had been scheduled to fly to London on an early morning KLM flight. "There were a couple of explosions which I think were a couple of gas canisters." "I would have expected more fire engines to respond faster," he added. There may not have been fire engines available to respond. The country's largest newspaper, The Daily Nation, reported last month that Nairobi County doesn't have a single working fire engine, and that three fire engines were auctioned off in 2009 because the county hadn't paid a $1,000 repair bill. "It is a disgrace of biblical proportions that the entire Nairobi County does not have a public fire engine in working condition," the paper wrote in an editorial last month. "When [government leaders] were debating their budgets, they did not deem it fit to set aside money either to buy new ones or repair the old ones. But they did set aside money to build mansions for governors, big vehicles for county executives and other needs without a direct benefit to Kenyans." The paper said the collapse of the fire department means responses to disasters is in the hands of private companies and the military. Fisher, a trade specialist who lives in Nairobi, described the scene as chaotic. "There was no one stopping any traffic going to the road to the airport," he said. "A number of fire trucks and ambulances were trying to negotiate their way through the lane.…They were trying to weave their way through a solid two lanes of cars." By early afternoon, passengers began to grumble that minimal assistance was being offered. Passenger Medr Gudru, a 66-year-old German, had hoped to fly home on Wednesday but the fire stranded him with no information, he said. "This is too much. It was very nice here but this is just a mess," he said. Kenya Airways, the country's flagship carrier, diverted five flights to Mombasa and said all of its transit passengers were being moved to hotels. The airline reported that one passenger and one employee suffered from smoke inhalation. Jane Waikenda, the director of the Department of Immigration Services, sent out rapid-fire messages on Twitter in a bid to soothe frayed nerves. "I would like to reiterate that we doing what must be done to have full immigration services up," she wrote, before adding moments later: "you can never please everyone. We appreciate being held accountable as we strive to serve all Kenyans fairly."